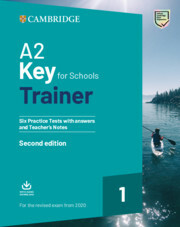 The 'with answers' edition can be used to practice the exam at home or in class, providing an excellent opportunity for teachers and students to familiarise themselves with the A2 Key for Schools examination format. The six practice tests feature explanatory keys and model answers, and include ideas for extending tasks in class. 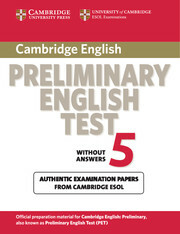 The first two tests also include step-by-step advice on how to tackle each paper. Extra practice activities, informed by a bank of real Key for Schools candidates' exam papers, focus on areas where students typically need most help. Downloadable audio includes the recordings for the listening tests. Designed for use both in the classroom and as self study. Includes six full practice tests, two tests with guidance tips and exercises to help students tackle each part of each paper. Tests 1 & 2 contain information about the exam as well as step-by-step guidance, exercises and tips. Tests 3 - 6 are straight practice tests without guidance. The extra grammar and vocabulary exercises focus on common A2 A2 Key for Schools candidate problem areas. These include real errors from Key for Schools candidates' exam scripts. A detailed explanatory key gives students and teachers clear explanations for both right and wrong answers, as well as model answers for the Writing paper.